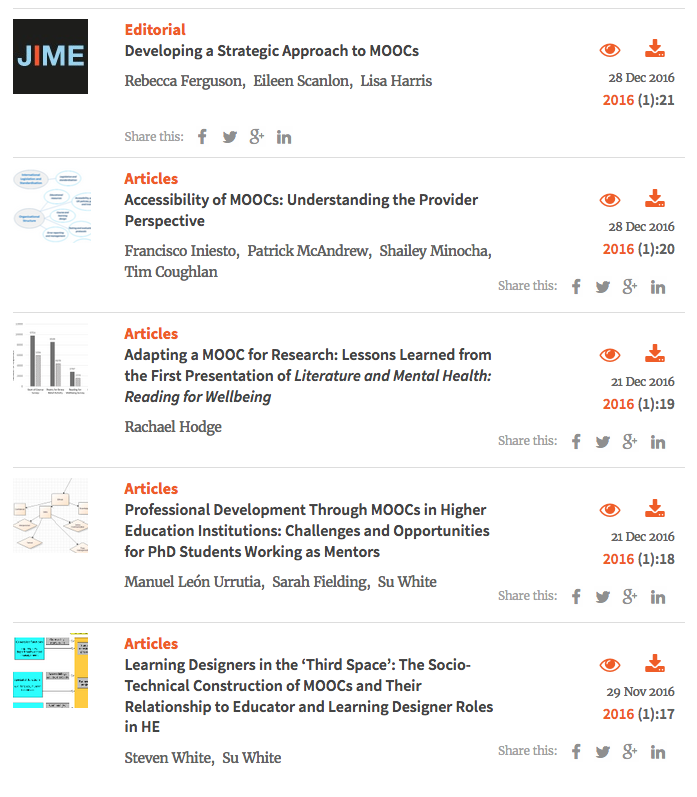 I was one of the editors of a special issue of the Journal of Interactive Media in Education (JIME) on Researching MOOCs. The special issue draws on the work of the FutureLearn Academic Network (FLAN), which is made up of academics st universities that are FutureLearn partners. Other editors were Eileen Scanlon (The Open University) and Lisa Harris (University of Southampton). The special issue contains five papers. This entry was posted on January 12, 2017, 10:36 pm and is filed under Esteem, Journals, MOOCs, Open online learning, Publications. You can follow any responses to this entry through RSS 2.0. You can leave a response, or trackback from your own site.